Star Light, Star Bright, let's go on a space adventure tonight! Barney(TM) encourages Riff(TM) to always reach for the stars, even when his homemade spaceship doesn't reach Mars. Baby Bop(TM) learns about Mr. Moon's important job lighting the night for the world, and BJ(TM) sees he's special just the way he is -- astronaut or not. 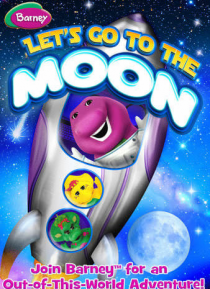 Barney and friends discover that the sky is not the limit when you … use your imagination!